Pricing | Find New & Used Car for Sale in NZ | Auto Insiders - The Ultimate Platform To Trade Automobiles ! You can purchase Credits to post Ads, Quotes, Offers or to perform Price Checks or Market Valuations of any new or used Vehicles. Register as an Insider or a Dealer, and you can buy Credits online. 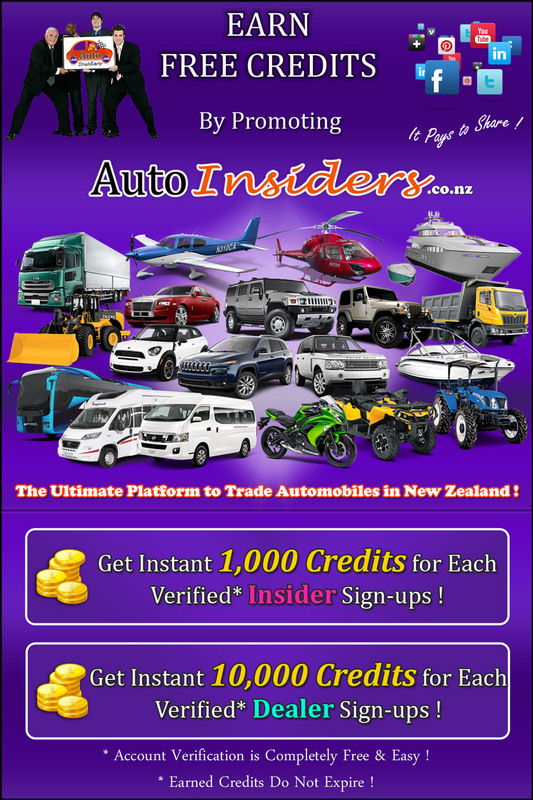 Also, Earn Free Credits by promoting AutoInsiders.co.nz to your family & friends. * Note: Purchased / Earned / Free Credits do not expire. The Lowest Cost is calculated when purchasing the Credits Pack 4 for Insiders and Credits Pack 3 for Dealers. Sell your New or Used Vehicle (Car, Van, Truck, Bike, Boat, etc.) quickly by posting a Sales Ad on AutoFair. You'll receive Offers (Buy / Trade / Exchange) from Dealers & Insiders or they may directly contact you regarding your Ad, using the contact details you provide when publishing the Sales Ad. Posting a Sales Ad costs less than $2.50 per month for an Insider, and less than $2 per month for a Dealer. Your Sales Ad will automatically expire after the selected number of days (max. 30 days per listing), and on the chosen date at Midnight (12:00 am). If the Ad has expired before the Vehicle gets sold, you can relist the Ad at anytime. The faster your Vehicle gets sold, the cheaper your Advertising costs will be. Upload a maximum of 21 High Definition Photos of the Vehicle and provide as many details as possible using the long list of properties & features on the Ad submission form. Promote your Ads as special featured Ads (Ad Highlight / Featured Ad / Super Featured Ad) to gain more exposure by giving them higher rankings in the AutoFair search results, and by grabbing the attention of the viewers when they perform a search. You have the power to give your Ads a boost in the Rankings by performing a Bump action, which puts the Ad on top of the search results each time. The Ad Bump can be performed after an hour the Ad was published or an hour after any previous Bumps. If you're looking to buy a New or Used Vehicle (Car, Van, Truck, Bike, Boat, etc.) then quickly post a Wanted Ad on AutoFair. You'll receive Price Quotes (Quick Price Quotes / Complete Price Quotes) from Dealers & Insiders or they may directly contact you regarding your Ad, using the contact details you provide when publishing the Wanted Ad. Posting a Wanted Ad costs just less than $1.25 per month for an Insider, and less than $1 per month for a Dealer. Your Wanted Ad will automatically expire after the selected number of days (max. 30 days per listing), and on the chosen date at Midnight (12:00 am). If the Ad has expired before you bought the Vehicle, you can relist the Ad at anytime. Boost the Rankings of your Wanted Ad by performing a Bump action, which puts the Ad on top of the search results each time. The Ad Bump can be performed after an hour the Ad was published or an hour after any previous Bumps. Rent your New or Used Vehicle (Car, Van, Truck, Bike, Boat, etc.) quickly by posting a Rental Ad on AutoFair. You'll receive Bookings from Dealers & Insiders who may directly contact you regarding your Ad, using the contact details you provide when publishing the Rental Ad. Posting a Rental Ad costs less than $5 per month for an Insider, and less than $4 per month for a Dealer. Your Rental Ad will automatically expire after the selected number of days (max. 30 days per listing), and on the chosen date at Midnight (12:00 am). You can take down the Ad when the Vehicle gets rented, and you can relist the Ad at anytime when it's available again. If you have a Vehicle that matches the requirements of a Wanted Ad or you're capable of catering the Advertiser's Vehicle in any way, just submit a Quick Price Quote in response to the Wanted Ad, which quickly outlines the important details of the Vehicle you have. If the Ad Poster is interested in the Vehicle, then you get the business. You can also create Quick Price Quotes and keep them saved by publishing them on AutoFair. Then use the link (URL) of the Price Quote to showcase the Vehicle in front of muliple users. Submit a Complete Price Quote in response to a Wanted Ad, if you have a Vehicle to sell that matches the requirements of the Ad, and you're willing to provide a detailed description about the Vehicle to the Advertiser. If the Wanted Ad Poster is interested in the Vehicle, then the deal is assured and you get your Vehicle sold quickly. You can also create Complete Price Quotes and keep them saved by publishing them on AutoFair. Then use the link (URL) of the Price Quote to showcase the Vehicle in front of muliple users. Upload a maximum of 21 High Definition Photos of the Vehicle and provide as many details as possible using the long list of properties & features on the Quote submission form. Submit Buy Offers to Sales Ads, if you are really interested in purchasing the Vehicle. You can specify the Buying Price, Offer Validity Days, Payment Options, Offer Conditions, Delivery Location, etc. Submitting a Buy Offer is the cheapest, easiest & unobtrusive way of contacting the Ad Poster in order to secure your beloved Vehicle. If you have a list of Vehicles to Trade, and you want to specify a Trade-In Value for the Vehicle advertised in a Sales Ad, then quickly submit a Trade Offer, specifying the Trade-In Terms & Offer Conditions. Best of all, you can keep a stock of Vehicles saved as Price Quotes (Quick / Complete), and provide their links (URLs) in your Trade Offer. Then the Ad Poster can go through your list of Vehicles and contact you if interested in your Offer. Submit an Exchange Offer to a Sales Ad, if you want to swap your Vehicle with the one Advertised. Select the Exchange Terms and specify the Exchange Conditions which suits you. Upload a maximum of 21 High Definition Photos of your Vehicle and provide as many details as possible using the long list of properties & features on the Offer submission form. Perform Quick Price Checks on any New or Used Vehicle that is either listed on AutoFair or that you know the details of. We have over 70,000 Vehicle Trims categorised and their Market Prices analysed every week in order to provide accurate price ranges, which you can make use of when deciding the price for a deal. Quick Price Checks can save you time and money, even if you have been a hard-core Car Dealer throughout your lifetime. Save the Price Checks and download them in .CSV or .TXT file formats for other uses. Advanced Market Valuations provide you with a solid edge over your business deals, where you attain the capability of bargaining down to the reasonable price when buying a Vehicle, or staying firm on your price margin when selling a Vehicle, either on AutoFair or out in the yard. Performing an Advanced Market Valuation just takes about 5 minutes of your precious time, and we have over 70,000 Vehicle Trims categorised and their Market Prices analysed every week. The more accurate the details you provide, the more reliable the Valuations will be. You can also save the Valuations and download them in .CSV or .TXT formats one by one or as a list for other uses. Below is a summary of Credits required to perform other Actions on AutoFair listings and some account management activities. You can purchase any Credits Packages listed below according to your advertising needs. Purchase any of the Credit Packages for the Insiders Account using Credit Cards, PayPal or Bank Transfer. Purchase any of the Credit Packages for the Dealers Account using Credit Cards, PayPal or Bank Transfer. * Please contact us if you need more than 300,000 Credits per month !